Now you don't have to worry about leaving your swagger behind between washes and blowouts! Dry Divas luxurious shower caps keep your hair looking its best, and making you feel like the glamorous "Diva" you were born to be. You may choose from several fabulous patterns, which Dry Divas have carefully designed to last for years to come. Each cap is manufactured with the highest quality laminated cotton fabric in the USA. 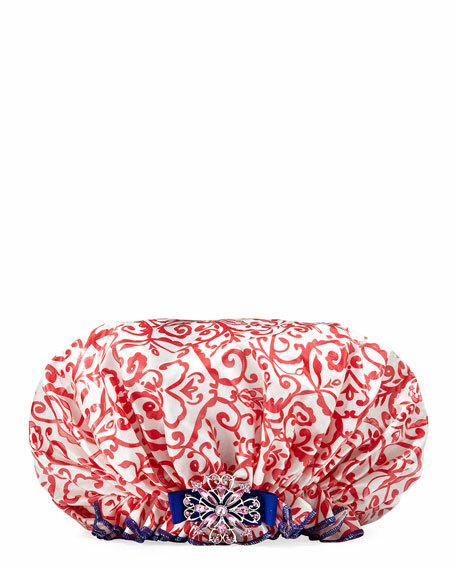 Dry Divas fashions each 22" Bouffant cap with a vintage jeweled broochlikely to sparkle in the morning sunshine. Please note: brooch design may vary. For in-store inquiries, use sku #1942555.